Racial Profiling. Wong Reducks, Jean-Georges' Home Cooking. Wine for Food Lover's. Penny's New French Interior. I get the Times delivered at home but on Wednesdays I like to buy the Post to see what dining outrage Steve Cuozzo's ranting about. The news guy outside our subway station sees me coming. He reaches for the Times and tries to hand it to me. "Not the Times. I want the Post," I say. Every time. I guess what I'm experiencing is a sort of "racial" profiling. Is it because I'm blonde? Or white? It's certainly not my sensible shoes. My experience is nowhere near the rage and fear of being stopped "on suspicion" and searched for no reason at all or being handcuffed and wrestled to the ground for walking in a no-walk zone or being the only one having my hands checked for explosive powder because my skin is beige. Still it just makes me stop and think every time. Fork Play colors this week celebrate Thanksgiving with cranberry and Cabernet. Sausage stuffing is my favorite thing about this holiday, but what color would it be? Beige? Tweed? I needn't have worried about the place drifting downhill. Simpson Wong has surrounded himself with a passionate, dedicated crew in the small space he built himself with recycled boards, school chairs and bookcases. His chef de cuisine Blake Joyal seems grateful and invigorated from having escaped the rarified h aunts of haute cuisine to help deliver Wong's unique "Asian Locavore" notions, a wonderful patchwork of mixed metaphors. I couldn't wait to taste the shrimp fritters that haunted me, the soft sticky rice noodles with a crackle of crunchy shrimp, green apple, ham, cucumber, torn basil splashed with a lemony nectar. Bonito flakes fluttered as if alive, atop a pot of chanterelles, enoki and shittake nesting a poached egg waited for me to smash it. 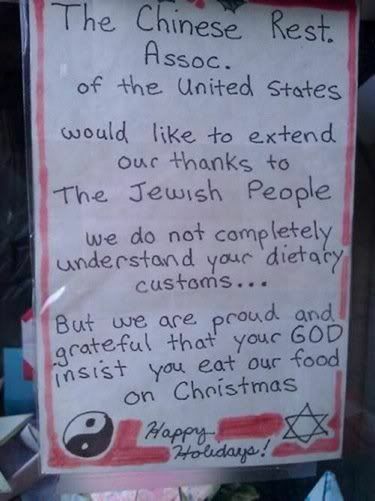 And I could have called for another one after quickly devouring my deep fried braised duck bun with ginger and black beans, except we were expecting a whole duck with sticky rice wrapped in lotus leaves. 7 Cornelia between Bleecker and West 4th Street. To read my first take on Wong, click here. To read Morais's version in Barron's, click here. Then please come back for the rest of Fork Play. I'm no longer an incurable cookbook collector. Eating out five nights a week doesn't allow for much cooking. And my shelves are already buckling so a food book has to be really special to be a keeper. It doesn't matter that I love Bobby Flay's cooking or admire Thomas Keller or have a warm spot for Jonathan Waxman and Larry Forgione. A book I keep has to be so beautiful that I want to eat the photographs. 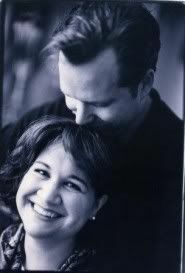 Or it can feed an obsession, like The Bacon Cookbook by Jim Villas. 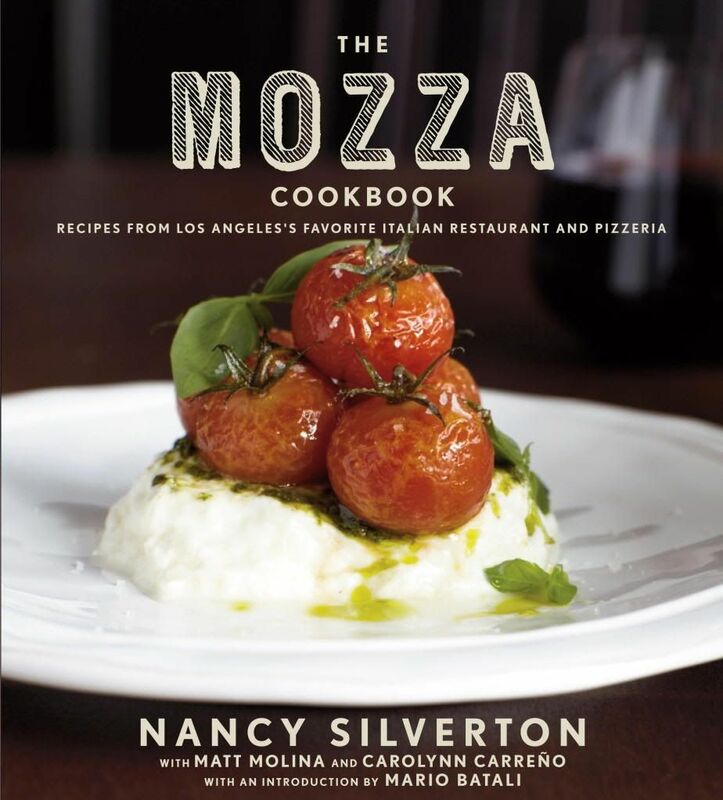 Or it can have the simplicity and purity of Nancy Silve rton's The Mozza Cookbook (Knopf $35) and make me think I might actually use it. But I had to have Home Cooking with Jean-Georges (Potter $40) as soon as I read that many of the dishes that curled my toes at ABC Kitchen came out of his seasonal improvisations at home: crab toasts with sriracha mayonnaise, spicy roasted carrots with avocado, sour cream and toasted pumpkin seed s, and butternut squash with balsamic vinegar and chile panko crumbs. 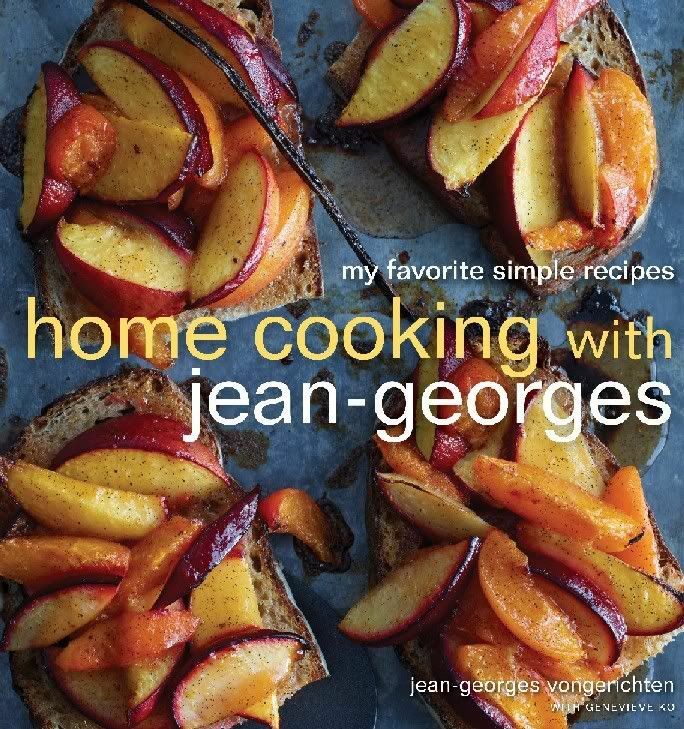 Jean-Georges says he came up with the technique of boiling a squash whole while watching a movie. 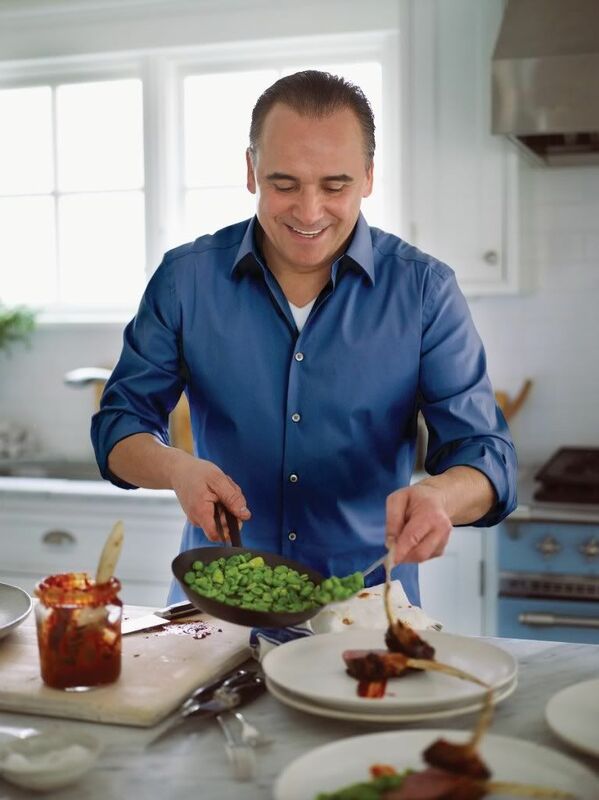 "I didn't want to miss the good parts - and the kids didn't want to pause it for me while I tended the stove." Tender and moist, this lazy-man's gambit emerged at ABC Kitchen last fall as a buttery squash crumble I crave. I tease my friends Karen Page and Andrew Dornenburg that I can't keep up with what book they're slaving over at the moment. They're too shamelessly prolific. And always working. 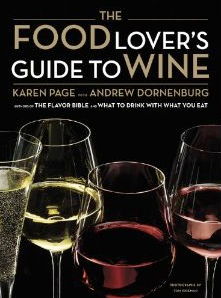 Then I got my copy of the encyclopedic Food Lover's Guide to Wine (Li ttle Brown $35). Obviously a lot of eating and sipping and gurgling and wooing sommeliers to get their secret yearnings went into their research. Gael: I know you include a sidebar that lists more than 150 wines under $15 but what are your personal favorites? Andrew: It's a tie between two sparklers, Gruet Brut sparkling wine from New Mexico and Lucien Albrecht Cr�mant d'Alsace from France. Both are great with salty and fried dishes, and with hors d'oeuvres at holiday cocktail parties or anytime. Gael: What wines do you two personally favor for holiday feasting? Karen: As the holidays are all about making everyone at the table happy, we like having both a white wine and a red wine on the table. We like a Gewurztraminer or Riesling as the white (esp. with the white meat), and for the red, a Pinot Noir or Cru Beaujolais (esp. with the dark meat). If it's a simple roasted duck, Pinot Noir is a classic pairing. We like to mix it up a little and also go with a Chateauneuf du Pape for its peppery notes and jammy fruit. By the way, when we say we want to make everyone at the table happy, we mean everyone -- so if there are non-drinkers present (whether pregnant women, designated drivers, or otherwise), we pour Fizzy Lizzy sparkling fruit juices in nice glasses, just like the wine. The Fuji Apple Fizzy Lizzy can be a stunt double for high-acid apple-noted Riesling, and the Cranberry Fizzy Lizzy takes the place of fruity Beaujolais or Pinot Noir. Hmmm....you didn't ask about pie. Both our friend Cynthia's apple pie and Bud "The Pieman" Royer's chess pie, pair beautifully with Eden Ice Cider from Vermont, which is the only non-grape-based wine mentioned in The Food Lover's Guide to Wine. Gael: What sommelier comment most surprised you? Karen: Most of us assume anyone with a French accent knows more than we do about wine. We were surprised to learn that when Per Se's sommelier Michel Couvreux told his French parents he had decided to become a sommelier, their reply was, "What's a sommelier?" And given the myth of haughty European sommeliers, we were amused that Le Bernardin sommelier Aldo Sohm, who was named the World's Best Sommelier in 2008, thinks of himself as an "Enjoyment Manager," bringing pleasure to people through wine. 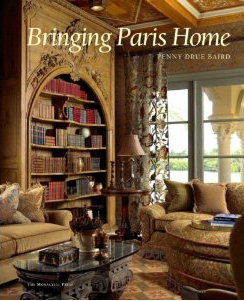 I've loved joining my friend Penny Baird when she stalks the Flea Markets at Clignancourt on the edge of Paris to bring France home for the clients who count on her luxurious home interior designs. She is known for mixing old pharmacy fittings and rustic cabinet work from ancient tabacs with vintage chandeliers, billowing iridescent taffeta and slightly shabby tufted leather love seats. 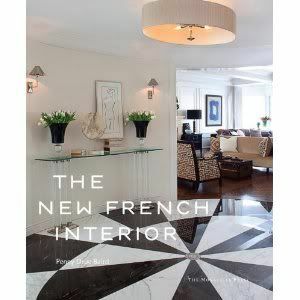 Now in her New French Interior (Random House $50) she moves beyond the traditional to explore contemporary and modernist design. Using ten of her own recent projects, she illustrates architectural details adapted from art deco, a monochromatic palette based on creams and ivories, bold forms in furniture and lighting, and restrained tabletop settings. You won't be surprised that I asked Penny wher e she likes to eat right now in Paris and her ideas for amusing young children. PENNY: My favorite "new" restaurants in Paris are the Atelier of Jo�l Robuchon on the Champs Elysees and the new Spring at 6 Rue Bailleul Want to be on top of things? The very popular Hidden Kitchen Supper Club by two Americans in their home is going public as Wine Bar and Restaurant Verjus. The wine bar opens any minute at 47 Rue Montpensier and the restaurant at 52 Rue Richelieu. Same place, separate entrances. My fall-in restaurant is Bucherie de la Rouilliere, Rue Cannettes near St. Sulpice. Warm welcome, fantastic bistrot fare, heavy on moelle, delicious frites and salads. My favorite pastry is the praline millefeuille from Laduree and in a pinch Pierre Herm�. For amusing the kids-a cooking lesson-lunch at Atelier des Chefs. My son Philip's favorite Le N�tre Wednesday class. All the museums have ateliers for kids all day Saturday. 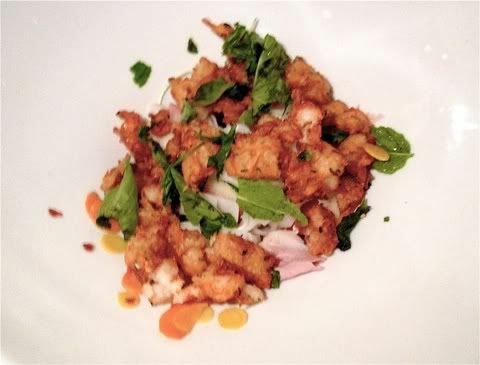 The photograph of Wong's shrimp fritters may not be used without permission from Steven Richter.